The mother of a heroin addict who froze to death in a field says she may never know how her daughter died after three policemen were cleared of killing her. Three Lincolnshire officers were found not guilty by a jury on the orders of a judge at Hull Crown Court. 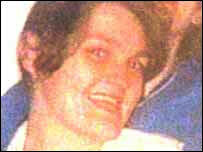 The body of Michelle Wood, 25, from Grimsby, was found near New Waltham, Lincs, in February 2003 - a month after she was left there following an arrest. 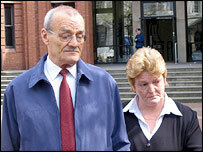 Joan Call said Ms Wood's children would "grow up with the same questions". PC Andrew Wood, PC Ian Clark and Sergeant Andrew Hickinbottom had all denied a charge of manslaughter by gross negligence. The mother-of-three was left at the boundary of the Lincolnshire and Humberside Police force area by the two constables. Mrs Call, 48, and her 64-year-old husband Alwin Call - Ms Wood's stepfather - stood outside the court by a Humberside Police press officer who read their statement. They said they were the glad the case had been brought to court. Their statement added: "We are saddened that, despite this, we still don't know why Michelle had to die and we fear that we will never know." The couple were satisfied that the death was treated seriously and was fully investigated by Humberside Police, the statement added. During the trial, the court heard how Miss Wood had been arrested on suspicion of attempted burglary in Louth, Lincolnshire, after going to the town to shoplift. The jury heard this was how she funded her serious heroin addiction. Officers took her from Louth to Skegness police station, where a decision was taken by custody officer, Sgt Hickinbottom, to release her without charge. The jury heard how the sergeant then ordered PC Wood and PC Clark to drive her to a point on the A16 close to the county boundary. She was found dead from hypothermia a month later about five miles from her home. The jury heard how, in their police interviews, the officers said they believed they had not breached their duty of care towards Miss Wood. Sgt Hickinbottom told detectives he understood it was his duty to return Miss Wood, who had no money or mobile phone, to Louth, where she was arrested. The court was told he believed he had gone further than this by ordering her to be taken to an area close to her home, where there was a service station and a public phone box. A statement from the officers issued after the case said that, despite "abuse of the drug Procyclidine", Ms Wood "would have appeared completely normal to the three defendant officers at the time of release". Allegations made against the officers, who had "many years of unblemished public service" behind them , had "no credible factual basis", the statement added. The Deputy Chief Constable of Lincolnshire Police, Richard Crompston said: "In liaison with the Independent Police Complaints Commission (IPCC), we will of course carefully consider the judge's comments whether any misconduct proceedings can properly be brought against any officers involved. "Pending that decision, no further comment is appropriate at this time."